Is There Anything Natural About A Man On Horseback? Inside the white doughnut of the hospital's imaging machine, I close my eyes and try to guess how I wound-up here, unable to recall my name or explain the robin's egg lump on my head. I know only that I had made a breakthrough in my relationship with Huck, and then found myself staring at my car and wondering if I really knew how to drive. Huck is a big, eleven year-old mustang mix, dun colored, with a thick black mane, black tail, and black socks. Though a mature gelding, he doesn't always act mature or gelded. On hunt courses he sprints through the woods to claim the lead even as his whithers get shredded by saplings. In the ring he's a schoolboy with attention deficit disorder, losing focus every thirty seconds and then startling at a leaf, a train whistle, a shadow. 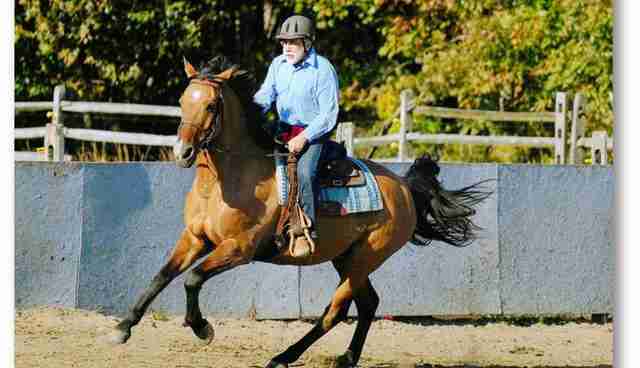 Years ago, Huck's owner, Chris, relied on me to settle his horse with rides that taught him to act like a gentleman. As someone who came to horses in mid-life, I am intrigued by natural horsemanship, which encourages a rider to understand what horses say with their movement and posture and to lead them with the quietest cues. It is an empathetic discipline that stresses relationship. Huck gave me the chance to build one with him. 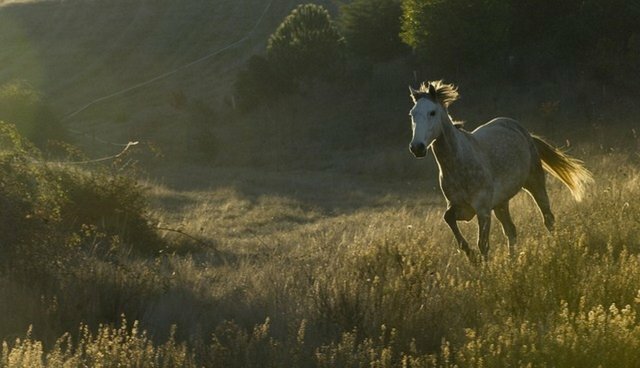 Five thousand years of breeding has given us horses that are willing to cooperate with us. Some people insist theirs enjoy their "work" and when you see a well-teamed rider and mount they can move with breathtaking grace. Still, finding success with a half-ton creature that can throw you to the ground with a shrug, requires real presence of mind. A horse will betray a distracted rider by bucking, hopping, or just refusing to move. But he will also reward your focus. The feeling you get when you think you have won a horse's trust is transcendent. Huck often needed firmer direction than I liked to give. But on many occasions we fell into synchrony, circling at a trot, transitioning to a smooth canter, and then slowing down to maneuver around barrels or cones. When this happened, I felt like we were showing-off, even if no one was watching. I thought I helped Huck to become a more complete horse. He was a hunt champion for Chris, and a trusty pleasure ride for me. Then, on an otherwise unremarkable day, he came hobbling into the barn from his turnout in a field. Veterinarians said he had the equivalent of a blown-out knee, and gave him a slim chance of recovery. During the months Huck spent healing, I moved on. Ace, a well-trained quarter horse, danced with me like an Arthur Murray graduate. I took pleasure in his predictable precision, but I missed Huck's energy. When he was sound enough to walk, Huck moved to a distant farm for rehabilitation. A year passed before Chris called to say Huck was ready. "Would you like to help get him into shape?" he asked. I fell into a horse whisperer fantasy, imagining a reunion with my old friend. When we got back to work I discovered that Huck had either forgotten, or rejected, our old ways. For weeks he juked and jitterbugged. Chris said, "There's a look in his eye, like he's in the horse world now." Another rider wondered if Huck had decided, during his hiatus, that he was retired. A trainer advised that his muscles had atrophied. He needed to be built-up with long walks, short trots, slow hill climbs, and descents. It was a sensible plan. On the next outing we worked hard and well. As I dismounted in the late afternoon sunlight, I thought I had whispered in Huck's language, and he had heard me. I felt exhilarated. When I came stumbling out of the barn, unable to recognize my surroundings, Huck stood quietly in the aisle, blinking his watery eyes. The cinch on his saddle was undone. My helmet rested on a hay bale. I couldn't remember anything, except the feeling that I had had a once-in-a-lifetime ride. After I was released from the hospital, my family asked me to break things off with Huck. They didn't trust him. I assumed that he was innocent, but if I wanted their support to continue riding, I had to agree. As soon as I was able, I went to the farm to see if something – a scraped branch, maybe -- could help me remember if I had fallen or smashed into something. I got no answers. Before I left, I stopped at Huck's paddock. Normally he would walk over to greet me with a snort. This time he stared at me but wouldn't move from where he stood with his buddy, an enormous pinto draft named Churchill. * * * What happened between Huck and me remained a mystery for a week. During a follow-up visit to my doctor, I yelped when he pressed the ribs on the left side of my body. "Aha!" he said. "You were kicked." The blow must have come as I carried Huck's bridle to a tack room at the back of the barn. For a split second I had been in range of his left hind leg. The force had pushed me to the right, where my head struck a stall door. The mystery was solved. But what was a natural horseman supposed to take from the experience? When a rider has a horse problem, the horse has a rider problem, too. Huck had told me that he had changed. I had altered the pattern of our exercises, but I had continued to make him work when he wanted to rest. I had listened, but not well enough. Perhaps Huck's injury had taught him that he is vulnerable, life is short, and he prefers the company of horses. I'll never know. I do know that after I stopped feeling betrayed, I began to wonder if what I saw in Huck years ago, had been my own reflection. Sometimes I struggle to be a gentleman. I resent being controlled, and no one can lead me in any direction but the one I prefer. Was my desire to ride him an expression of my own desire for control? Had I led him in a dance, or pushed him around? The questions horses provoke are a gift. They make us examine our motives, our values, our behaviors, and our assumptions about nature. Huck has also made me wonder whether there's anything natural about a man on horseback.